Can you limit hours the phone rings? Posted: Tue Aug 28, 2018 2:45 pm Post subject: Can you limit hours the phone rings? 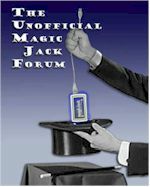 Is it possible to have your magic jack (mine is the plus) only operate certain hours of the day? For instance, I'd like mine not to ring at all between 10pm and 6am. I know I can simply unplug it and plug it back in but I'd prefer something more automated. Maybe look into a plug in outlet timer. I use them to turn my lights on and off when I'm away to make it look like someone is home. You can pick one up for a few bucks. You can on some Panasonic phones. I can on mine TX-TG6533 its an older one. Probably 7yrs. Its called Silent Mode on newer Panasonic's.